Drink more water for your health. Ice counts, sure, yes, it’s technically water 🙂 But it’s not enough. Full disclosure: I’m an ER nurse who sees elevated blood glucose levels on a daily basis. I see blood sugar levels that get high and stay high, lead to complications from diabetes that include blindness and kidney failure and even amputations. Many things lead to increased blood sugar levels, but I want to talk about a personal enemy of mine: Soda. A 20 oz can of soda has approximately 16 teaspoons of sugar in it. Imagine sitting down and attempting to chew and swallow those 16 teaspoons in one sitting- it’s gag inducing! So here’s the deal. You could fill a book with all the studies that are coming out highlighting the negative effects of soda- from obesity, diabetes and cardiovascular disease to premature aging and decreased memory. I think it’s been thoroughly established how bad soda is for you. So I’d like to take the time to offer some fun and delicious alternatives! Infused water! Easy and fresh- especially in the summer. Add fresh fruits like lemons, oranges, and limes to cold water. Cucumbers are also especially refreshing! You can spice it up a step further with some fresh mint. 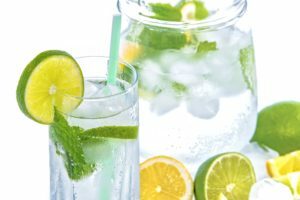 Seltzer water with a twist! This one is easy- get some fizzy water and squeeze a fresh lemon in it. Bubbly and happy! Kombucha! A fermented probiotic drink made from tea. It’s tasty and zesty and ends up practically sugar-free. Plus, it has healthy bacteria and increases metabolism. Try a ginger or a cayenne version to add some kick to your day! TrueLime packets! I recently discovered these powdered packets, and they’re practically a life changing experience. They’re simply crystallized limes- cheaper than fresh limes in the winter, and more portable! They also have a black cherry-lime version that is sweetened with stevia. This is an excellent way to trick yourself into drinking more water, and my absolute go-to at work. Great share. Dehydration causes xerostomia , ulceration, caries and many oral lesions. Glad to see this article. We wish Dr. Haridas and all his team out in Pune India much success. Thanks for stopping by. Informative article sir. Detox water are going good now a days, we can always have intake of it. Thanks for stopping by Esha, We wish everyone at https://www.wcidentalcare.com/ the best. Great Article, water is essential for human body to keep our health good, now a summer days so drink more water as much as possible. Thanks for coming by, we appreciate all comments from the dental community. Give my best to all your staff.